Qatar Airways has today taken delivery of the first A350 XWB at Airbus’ headquarters in Toulouse. The Gulf carrier, which has 80 of the wide-bodied aircraft on order, was originally scheduled to receive the Airbus jet on December 13 but delivery was postponed just three days beforehand (see news, December 10). 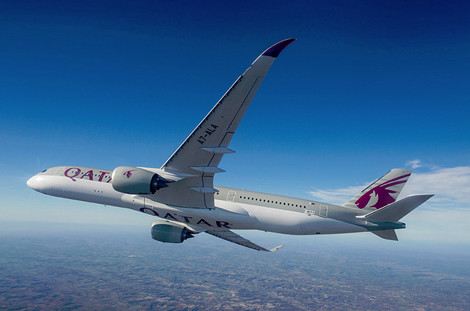 The A350 will enter service on Qatar Airways’ Doha to Frankfurt route in January (see news, October 20). It will seat 283 passengers, with 247 in economy and 36 in business class. Today’s ceremony in Toulouse marks the official delivery of the A350 to Qatar Airways. It will be flown to Doha tomorrow, after a short 45-minute flight around Toulouse this afternoon. Business Traveller will be on that flight and will post photos and a report later today. The airline expects to take delivery of eight A350s before the end of 2015. It first placed an order for the aircraft seven years ago. Earlier this year, Airbus took the A350 XWB — bearing Airbus/Qatar Airways livery — for a test flight (see news, March 2). The development aircraft has since finished a world tour, during which it touched down in 14 cities.